A horse at the Beltex horse slaughter plant in Texas in 2005. Some slaughter advocates are acting as though the American Horse Slaughter Prevention Act is now law and that we suddenly have a problem due to a lack of a US-based horse slaughter industry. But they fail to take into consideration that US horses still go to slaughter. Your friendly neighborhood kill buyers are still doing business at the auctions and 134,059 US horses went to slaughter in Mexico and Canada last year. Those numbers really aren't that different from the number of horses slaughtered per year in recent years. "Now our challenge becomes looking at ways to introduce an 'equine economic stimulus package' that will boost registration numbers so we don't have a horse shortage in a few years." There is, in my view, a certain amount of hypocrisy on the part of the AQHA when they speak about needing slaughter to prevent horse abuse then stating they intend to put more horses on the ground. According to the article "Leading Indicators" in the January issue of Equus Magazine (part 1 part 2) the AQHA has boosted their registration numbers: 140,000 Quarter Horses were registered in 2008, which is up from 135,787 in 2007. It seems to me that if there is a horse overpopulation, the AQHA is contributing to it. Another interesting fact relating to the AQHA is the bill in North Dakota calling for a "study" on horse slaughter. The man who introduced this bill, Representative Rod Froelich, is a quarter horse breeder. You can read more about the AQHA's breeding practices here. It appears that selling to the slaughter market is a profitable side business for Quarter Horse breeders, which might explain why some are fighting so hard to keep the horse slaughter industry alive. The AQHA and American Veterinary Medical Association (AVMA) claim that horse rescues are at full capacity and can take no more horses, yet in a recent article appearing in AZ Central there is a rescue mentioned that is at about 50% capacity. I'd be willing to bet that there are others. The AQHA and AVMA argue that slaughter is needed in the US again because it can be "regulated" to ensure that the process is "humane." But information from the US Department of Agriculture under the Freedom of Information Act shows otherwise in this press release (warning, the images are graphic) and in this article. A question I'd like to ask the AVMA is how they can consider horses being transported to slaughter with broken legs and eyes gouged out (this is done to "unruly" horses apparently) to be "humane and well regulated". 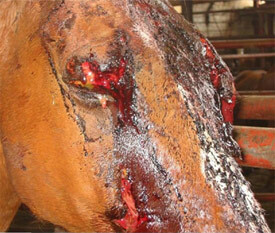 The AQHA and AVMA have been saying that slaughter is necessary for horse welfare for many years now. Polls have shown that most Americans don't approve of horse slaughter and would prefer to find another solution to the so-called problem. The reality is that the pro-slaughter side is quick to point out a problem, but only offer slaughter as a solution. Those opposed to slaughter tend to offer real solutions - a case in point is Madeline Pickens offering land to allow the wild horses that our government has in its holding facilities a place to roam free. Why is it that our side seems to be all about solutions? One would think that with the money and resources the pro-slaughter side has that they could also step up to the plate with an alternative to slaughter, but they fail to do so. No new ideas have come from the AQHA or the AVMA. Instead, what pro-slaughter do is stirrup trouble. At present there have been bills introduced in Montana, Missouri and Arkansas to allow horse slaughter, and in Illinois to overturn the ban signed into law recently. In Utah, the legislature has already passed a non-binding resolution opposing the federal law (that being HR 503). Arizona, Kansas, Minnesota and Wyoming are considering similar resolutions. The pro-slaughter side has stepped up their game recently since the changes in Washington DC which now favour passing a federal bill to ban horse slaughter. These state initiatives will be rendered irrelevant if HR 503 becomes law. Slaughter opponents need to keep the focus on passing that bill through both chambers of the US Congress and getting it signed into law by the president. To do this, it is imperative that those against slaughter continue to challenge-slaughter rhetoric.